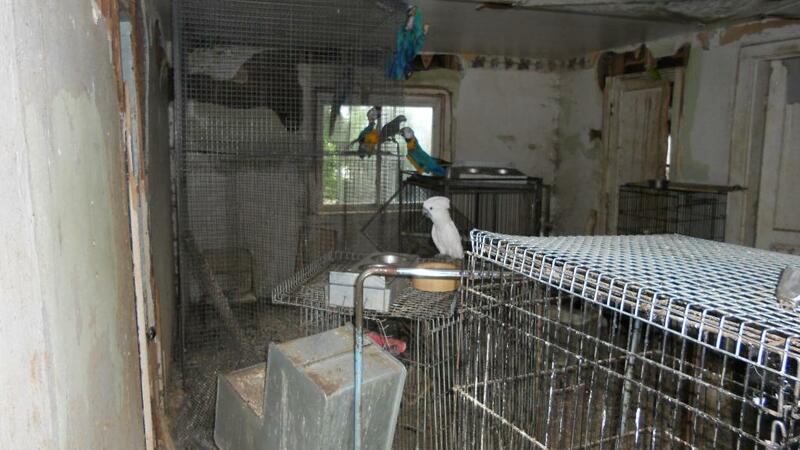 I was reading some comments the other day regarding some of the very sad pictures of abuse and neglect to parrots (and all animals), and how very disturbing and difficult it was for some to view them. While I did not post this sentiment, I must confess that it truly hurts my soul to view these terrible pictures and videos. They literally haunt me, I can never erase them from my memory. I carry them with me wherever I go and I am so saddened by them at times, that I have to just cry for a bit. However I still look at them and I still watch the videos and then I do everything I can do help make a difference. I am also one of the people here on Facebook that posts these horrible visions. As I post each one, I watch again and then I strengthen my resolve to do even more to help end their misery. So while I do love seeing pictures and videos of parrots who are healthy and happy, I know so many are not. I cannot ignore and shut off what I have seen and know. I have looked into the eyes of some of these precious souls and I made them a promise to not forget them, to not just walk away, to not pretend they didn’t have a heart and soul with feelings. I know that some feel we are posting and preaching to the choir, and some days I have wondered this myself. Then I will get an email or message from someone that thanks me for a post or sharing a link, and they say that they hadn’t been aware before. I have helped folks get in touch with their local rescues to adopt, rather than making a purchase. I have folks who have asked about where to make donations, or how they can help in their own communities to make a difference. I have had folks who ask how to find an avian vet. Some just send a note to say TY for sharing and caring. So while it seems as though we can’t possibly be making a difference, some are learning and if our continued posts help to change the life of just one bird somewhere…then it is worth it! Our circle of friends are ever-expanding and changing. This is a wonderful place to network , share, grow and educate. This is how knowledge is spread and awareness develops. I know some of the pics and scenes depicted in the videos are so hard to view, but the simple fact is that the poor creatures in those pictures, are suffering. Some may think well those are “just animals”, what if it were a human in those pics? Human trafficking is happening and has been in existence for a very long time, how much worse do things have to get before we stand up and say NO! Isnt every life precious no matter the species? If we can’t even make a difference for the small helpless creatures, how on earth will we stop abuse of humans also. If we all turn away, then who is going to do something about it. Who will make it end. Who will step up and be a voice for those who have no voice of their own. I would truly hope that humanity has more compassion than to allowing the suffering to continue. There are so many wonderful organizations out there trying to stop abuse and neglect (in all aspects of life), I believe it is up to each one of us to find what touches our heart the most and then become part of the solution. If we all do nothing, then nothing will change. Ignoring the ugly side of life, will only do two things …. allow it to grow and continue. By saving them, we are saving ourselves. As part of the human species, isn’t it our duty to make this world a better place for all living creatures. I still have faith that there is more good than ugly in this world, and I for one will do everything I possibly can to help make a difference! I will however promise to make a disclaimer on any of my videos, links or articles if they contain graphic scenes, then those who choose not to view will have been given the opportunity beforehand. I respect and care about the wishes of others and in no way wish to force anyone into viewing something that they would find offensive. Well said Deb!! And I walk that road with you!! You are not alone, but unfortuneatly they still suffer in silence! We will be their voice together!!! We can make a difference. Perhaps in our own little area of the world, but we can. You are so correct Lisa, and this is exactly the way to view it so that we dont become overwhelmed. One Angel at a time! Think Global and work local. Together if we all help just one at a time, what a difference that will make! You cannot change what you do not see. By shutting ones eyes and emotionally stepping away from the problem you will never become part of the solution. That’s why the problem is so big – too many people emotionally detach. Well said, and good idea about posting a “graphic warning” I have had a comment that posting such items are disturbing and …. well you know the drill. I am with you we can never get complacent thinking that “oh well everyone knows whats going on. The only way to make headway in stopping it is to keep it in the forefront. People need to get angry enough to collectively scream ENOUGH. God bless you and all that you do for our feathered friends. May we all be a voice for them. Tough for me to look at them too. Makes me hurt really. But I know I can’t ‘save them all’ so I saved one. This one will be with me always. He may always be nervous and a bit afraid of hands….but he will never again be left alone with dogs trying to eat him….or shuffled from home to home with not even a name. So for me, besides donating what I can, this will be my grace as I grow old. I love my birdie.